Hey Ooch! Just wondering if the directions for solving the cube are clear and easy enough for a 9 year old. Noah just got one last month and I am sure that he would LOVE to learn how to solve it, but I don’t want to direct him to the link if it will be insanely frustrating for him. Just wondering what you thought about the ease of understanding the directions. Thanks!!! Hey Dana! I learned how to solve the cube with a dvd that came in the package. However, the videos on the site seem to be pretty clear and I think with a little focus Noah will be fine. Also, downloading the solution guide would be helpful. Here’s the link to the solve page – http://www.rubiks.com/solving-center/solve_rubiks_3x3_cube.php It’s all there. Have fun! 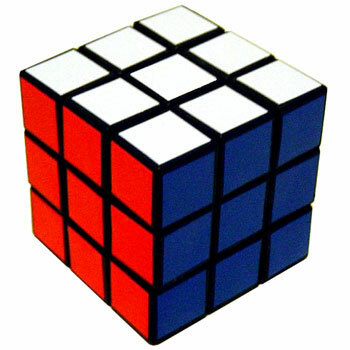 And if he gets frustrated let me know and I’ll try to track down the videos I used to learn the solve of the 3X3! Good luck! Yeah, it can get a little confusing. I’d suggest taking it one step at a time and going real slow. Good luck!! I did it! The solution guide made all the difference. Thanks:) Now I just have to learn how to do it with out looking at the directions so that I can teach Noah how to do it. I kind of hate to mess it up after it took so long to do it, but practice does make perfect! Congrats, Dana!!!! I knew you could do it!! I’m glad that the guide helped. Go ahead and mess that bad-boy up!!! If you did it once you can certainly do it again. PLUS, you’ll need to do it over and over and over and over and over so you can eventually memorize it. I’ve found that it’s wicked fun, actually. I solve the cube now as a stress-reliever! Awww yeah!! Well, you must be getting sick of hearing from me by now, but I told Noah that I would send you another message! So, I messed it up and had Noah sit with me while I followed the directions for solving it. Then I gave him the cube and the directions and left him alone for a while. Well, he came to me twice for a little help, but wouldn’t you know it, he managed to figure it out a lot faster than I did! I’m not sure if I should be more embarrassed (for myself) or proud (of Noah)! I think that I’ll settle for a combination of both. The look of pride on his face was worth the embarrassment:) Thanks for the cube help and info! Is there anything you can’t do? My iMac doesn’t seem to be working right….. Thanks! You made Noah smile yet again (me too). It is funny how the praise means more to him when it comes from you! Ah, the life of an idol! Hey! I don’t know if I can actually help you because I’m not sure exactly where you’re stuck. All I can say is stick with it and keep trying!! I know that the algorithms get longer the further you progress in the solve. The last two steps may seem complicated but I’ve memorized them so I don’t have to look at the cube for the last step. I’m sure you can, too!